The Crown Vacuum Tight Roll Off storage containers offer a cost effective way to store and transport liquids and sludges for disposal. They are ideal for improving the utilization of expensive vacuum trucks. 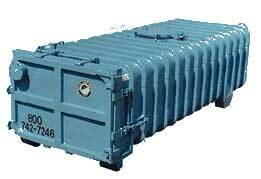 These containers provide cost effective storage of materials for testing or future treatment. The heavy duty construction, positive seal hatch and gasketed door provide for secure containment of materials. The two 8" flanged inlets enable efficient loading and unloading. The roll Off design allows for easy transportation using standard Roll Off trailers. The 25 yard capacity is an industry standard. All 1/4" steel construction, externally braced, totally enclosed including 30" top access hatch and positive seal door. Gasketed rear door with ten place locking mechanism. Roll Off chassis compatible with standard Roll Off trailers. Heavy duty solid steel rollers and tow bit for convenient loading and unloading. Rain for Rent, 3404 State Road, P.O. Box 2248, Bakersfield, CA 93303. Tel: 800-742-7246; Fax: 661-393-6897.